This is such a pretty dessert! 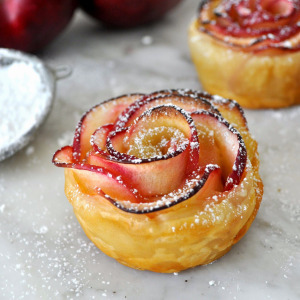 Manuela from Cooking with Manuela shows you how to make these delicious rose shaped apple baked delights using just two apples, apricot preserves, pastry dough, cinnamon and a sprinkle of powdered sugar is added after baking. Came across this refreshing yummy recipe on Pinterest and have added it to the list for the Forth of July BBQ! It is made with fresh peaches, onions, peppers, cilantro and more. Fresh Peach Salsa Recipe | NatashasKitchen.com.